Electric Fields will celebrate its 5th Birthday in style at Drumlanrig Castle with Noel Gallagher’s High Flying Birds on headline duty. How do you take the best weekend of the summer and make it even better? You can’t, can you? Don’t tell that to the organisers of Electric Fields as every year they prove us wrong. 2017’s festival in the grounds of Drumlanrig Castle was one of our top 2 festivals of all time. 2018 is set to be even better. 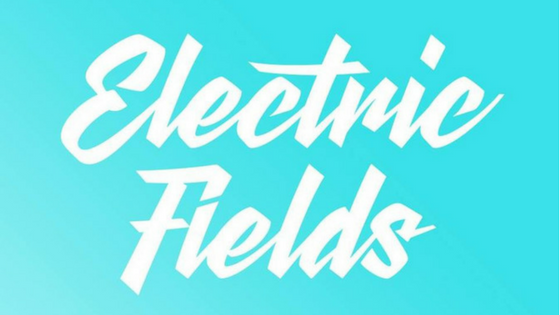 They’ve added an extra day – Electric Fields will be over three days in 2018 with the gates opening on Thursday 30th of August and going on until Saturday 2nd September. More stage time to fill is the line-up diluted? Absolutely not! 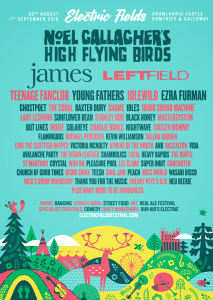 The line-up is incredible – When you announce one of the biggest bands in the world, Noel Gallagher’s High Flying Birds, as your headliners and then add indie icons James and electro pioneers Leftfield to the mix and you have something for everyone already. Then you add the “undercard” I add the dittos as Teenage Fanclub, Young Fathers and Idlewild would be highlights at most festivals in the UK. Then there is the rest of what has been announced and lots more still to be confirmed. Yes, that’s right there is still more to come!! Electric Fields hasn’t shied away from its roots and you can expect the best new Scottish music to be showcased throughout the 3 days. With A&A favourites, Rascalton, Lucia, Wuh Oh and Chuchoter amongst others already announced. Neu Reekie will once again curate the spoken word element and Sneaky Pete’s will be on hand to get us dancing in their own tent (one of our late night highlights from last year). We are already wishing the months away.